The Colorado Rockies were one of baseball’s biggest surprises in 2018, with 91 wins and a trip to the NLDS after beating the Chicago Cubs in the NL Wild Card Game. It was expected that the Rockies would experience some regression in 2019, with most projection systems viewing the them as around a .500 ballclub. Then again, that’s close to what the computers thought last year when Colorado won 91 games. But if the Rockies are to surprise again this season, they’ll have to turn things up a notch. That’s putting it nicely, because they’ve been absolutely awful to begin the 2019 campaign. Colorado lost 1-0 to the San Francisco Giants on Thursday night at AT&T Park, dropping their record to 3-10 on the season. It’s the Rockies’ sixth straight loss, and their 10th loss in their last 11 games. Nolan Arenado lined out to Gerardo Parra in left field and the Giants squeaked, 1-0. Rockies have lost 10 of 11. They are 3-10 overall — matching the worst start in club history, from 2005. The Rockies somehow look worse than a 3-10 team to this point when you dig into the numbers. For example, the Rockies are tied for last in the majors in run differential at -32. And the most incredible nugget, pointed out by The Athletic’s Nick Groke: Colorado has led for just five outs over the past 101 innings (or, over 11 games’ worth of innings). In their past 101 innings, the Rockies have held a lead for exactly five outs. On the pitching side of things, the Rockies — currently with a team FIP of 4.82 — will likely see some improvement. The rotation is an underrated unit, led by Kyle Freeland, German Marquez, and Jon Gray. But the offense has been alarmingly awful, and that has to be concerning for a team that plays home games in the arcade ballpark that is Coors Field- many runs will frequently be necessary to win ballgames. As a team, the Rockies are batting .208 (6th-worst), with a .272 on-base percentage (2nd-worst), and a .323 slugging percentage (2nd-worst). They’ve hit just eight home runs (2nd-worst), have just one stolen base (tied for worst), have a .262 wOBA (3rd-worst), and have a 42 wRC+ (worst). Their position player group has been worth -2.0 WAR according to FanGraphs (fWAR), which is 1.3 worse than any other team. Only two of their position players have been worth positive fWAR- David Dahl (0.3) and Trevor Story. And Dahl just went on the injury list. 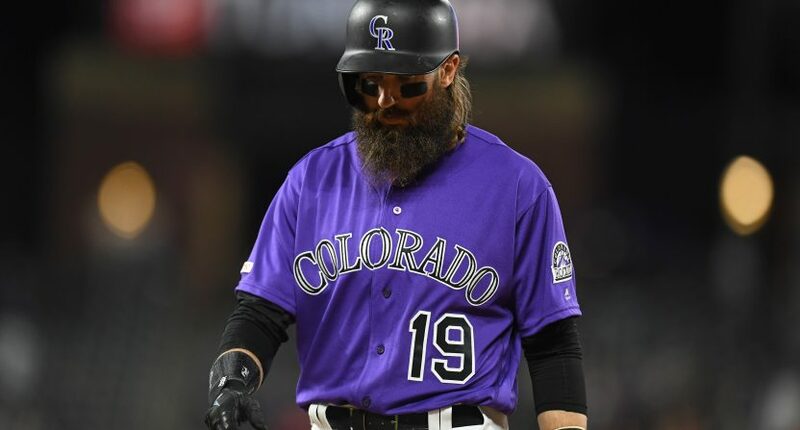 Now, we know that Nolan Arenado — .260/.309/.340 — and Charlie Blackmon — .250/.315/.354 — will get it going offensively, potentially in a big way (especially in Arenado’s case). Additionally, Dahl and Daniel Murphy — likely out for a month with a finger injury — should provide a boost to the offense. But this was expected to be a below-average offense on paper (at least when you take out the Coors-boosted looks of it) and it’s been beyond terrible to begin the season. So, it’s right to be a bit concerned if you’re a Rockies fan. There’s a long, long way to go in the season, but the Rockies’ offense will need to perform significantly better for this team to contend for a playoff spot again.